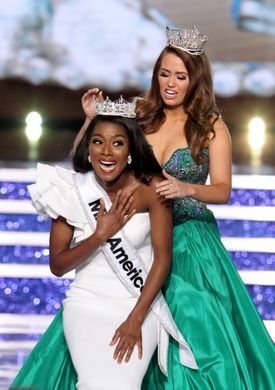 Miss New York Nia Franklin was crowned Miss America 2019. Miss Connecticut Bridget Oei was the first runner up, followed by Miss Louisiana Holli Conway, Miss Florida Taylor Tyson and Miss Massachusetts Gabriela Taveras. 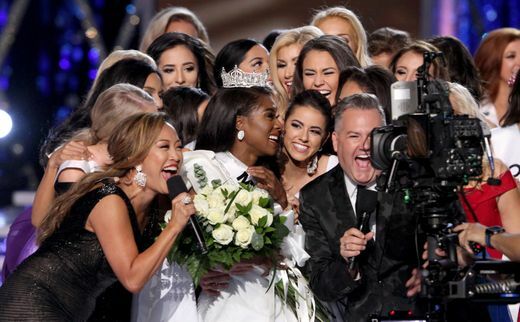 Miss America 2019 happened at the Jim Whelan Boardwalk Hall, in Atlantic City, New Jersey. The annual show was hosted by Dancing With the Stars judge Carrie Ann Inaba and co-hosted by Ross Matthews. The tradition pageant, which walks towards its 100th edition (this was number 98), displayed new features this year, making an effort to better its own image after the scandals it faced in recent times. Miss America 2018 Cara Mund crowned Franklin, who now begins her yearlong journey as the face of the organization. Franklin thanked her loved ones during her acceptance speech at the show. "It took a lot of perseverance to get here, and I want to thank my family, my mom and dad, who is a survivor of cancer. And all my sisters behind me, I love each and every one of you," she said. "I grew up in a school with only 5% minority, but growing up, I found my love of arts and through music, I felt positive about myself and who I was. That's what I would encourage young girls to do, find who you are." A whole host of celebrities comprised of the judge panel. Boxing champion and cookbook writer Laila Ali was a judge alongside country music stars Bobby Bones and Jessie James Decker, former American Idol panelist Randy Jackson, award-winning journalist Soledad O'Brien, Drybar founder Alli Webb and regular guest co-host of The View, Carnie Wilson. Former Fox News anchor Gretchen Carlson, Miss America 1989, took over as Chair of the Board of Trustees, promoting changes such as the elimination of the swimsuit competition. Carlson claims that the competition would be scrapped because Miss America is "no longer a pageant, but rather a competition." Another change was the debut of the red carpet competition, which accounts for 20% of the contestants' overall score. After walking a red carpet in the evening wear of their choice, the participants shared a short message with viewers, similar to how a celebrity might respond to a question on the carpet. This was heavily criticized on twitter: "This 'red carpet' format is boring and not elegant at all", shared a viewer. "Red carpet competition??? This is why Miss America will not be a thing in ten years. Is it called evening gown Gretchen", said someone else. Some people also wanted more of reigning Miss USA Cara Mund, who claimed the organization's leadership "silenced me, reduced me, marginalized me, and essentially erased me in my role as Miss America in subtle and not-so-subtle ways on a daily basis". Organizers denied it, but did not let her get close to a microphone during the live show. Finally, when the new Miss America was crowned, the famous song "There she is, Miss America", and the long runway MA traditionally walked immediately after being crowned, were gone. In general terms, people did not approve the changes and want Miss America to go back to what it was. GB comment: Evolving with times is always good when you "evolve right". Miss America has always been a "competition", and sorry Ms. Carlson, but it keeps on being a pageant .Perhaps now a boring one, clearly disliked by its audience. Not allowing Cara Mund to speak was a big mistake. Much of its glamour and good energy are now gone, and it will take a lot of good changing for Miss America to get back on its feet. I hope organizers can see it and start rethinking it again. On a positive note, the winner is pretty, talented and smart, deserving her victory. We wish her a great year ahead! Photos credit: THOMAS P. COSTELLO, Asbury Park Press, USA Today. See more photos on USA TODAY.